In the fight for cleaner air, the voluntary steps we take to reduce emissions go a long way towards improving the quality of the air we breathe. Luckily, there are countless ways individuals, businesses and municipalities can do their part! Provide employees with carpool matching services, vanpool formation assistance, help planning trips on mass transit and access to a Guaranteed Ride Home. Offer incentives to those who utilize alternative modes for the work commute. These can include convenient or free parking for those who rideshare. 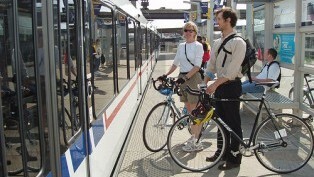 Offer a subsidy to offset some or all of the cost of transit passes or vanpooling. 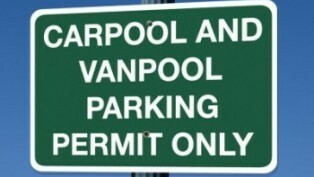 Offer pre-payroll tax deductions for transit passes or vanpool credits. Make it easy for employees to walk or bike to work by providing bike racks and shower facilities. Offer telecommuting as an option for employees who can do some of their work from home. Offer flex-time that allows employees to work shifts that are before or after rush hour. Offer compressed work week schedules so employees only have to commute 4 days a week. When possible, conduct meetings by conference calls instead of traveling to meet in-person, off-site. Encourage employees to brown bag their lunch or walk to lunch, rather than driving. Choose lower emissions/hybrid-electric vehicles or vehicles that run on alternative fuels, such as compressed natural gas or propane. Refuel before 10 a.m. or after 7 p.m. on poor air quality days to help prevent the development of ground-level ozone. Avoid excessive idling of vehicles and excessive speed, and provide access to real-time traffic information to avoid traffic tie-ups and reduce driving. Conduct energy/lighting audits and institute energy management programs at all facilities. Adjust thermostats. Turn down the heat at the end of the day or raise the setting for cooling. Turn off lights in areas not in use, and use energy-efficient fluorescent lights. Install timers or motion sensors to turn off lights that are not frequently used and use timers to automate heat and cooling settings. Use solar timers for parking lot and walkway lighting. Install reusable furnace and air conditioning filters and clean them monthly. Select Energy Star appliances and equipment and establish a regular maintenance routine to prolong the life of the equipment. Use fewer fixtures and incorporate direct/indirect lighting. Install energy-saving software on computers. Ask employees to turn off computers and monitors overnight, instead of just allowing them to go into sleep mode. Install heat recovery equipment on large air conditioning units to preheat water. Stock the kitchen with reusable utensils to avoid the waste created by the use of plastic utensils or paper plates. Pay attention to the air quality in and around the office (i.e. emissions from vehicles idling outside, chemical use and inadequate ventilation systems). Use walk-off grates at entries for people to wipe off heavy dirt that can contain particulate matter. Print smarter. Try printing on both sides of a sheet, or use the back side of old documents for scrap paper or drafts. Go paperless when possible. Post employee manuals and similar materials online rather than distributing print copies. They're easier to update that way too. Choose electric, propane or solar-powered tools. Avoid using gas-powered lawn and gardening tools, especially on poor air quality days. Reduce mowing time by seeding grassy areas with slow-growing grass or try natural landscaping around buildings. Avoid spilling or overfilling gas-fueled equipment. Choose a building site with access to natural light and shade to reduce dependence on heating and air conditioning. Look for sites that have access to public transit. Implement daylighting, sloped ceilings, inner windows/atriums and other passive solar techniques, and consider daylight harvesting techniques. When making product selections, look for high recycled content, local and regional sources for manufacturing and harvesting, and seek out rapidly renewable materials. Reduce the heat island effect by minimizing the amount of paved areas and dark roofing material. Avoid using products with Volatile Organic Compounds (VOCs) and urea formaldehyde, and pay special attention to CFCs and HCFCs in HVAC equipment. Research financial incentives and regulations that facilitate green design. Use paints, caulks and adhesives with no VOCs. Look for non-solvent containing stripping products and environmentally-friendly cleaning supplies. Buy only the paint you need & recycle left over paint properly. Store solvents in air tight containers. Use any chemicals that don’t contain VOCs in ways that minimize evaporation, or delay using them when ozone levels are high. Update your Mission Statement or annual goals to reflect a commitment to clean air. Encourage formation of a committee to oversee clean air initiatives. Provide access to information about ways your employees can help improve air quality. Walk or bike for short trips when weather and air quality conditions are favorable. Walk to lunch. Your car emits the most pollution during short trips. Take advantage of workplace flex-time and telecommuting options. When taking transit, biking or walking to work, consider carsharing opportunities as a way to get to and from midday errands and meetings. Visit www.enterprisecarshare.com for info. Share the ride with friends or use transit to get to social and recreational activities. Avoid “topping off” your gas tank. Gasoline pollutes the air when it evaporates. Choose a fuel efficient vehicle. Every gallon of gas saved keeps 20 pounds of CO2 out of the atmosphere. Drive smarter. Gas mileage decreases rapidly above 60 miles per hour, so avoid fast, aggressive driving that wastes fuel. Replace your air filter at least every three months. Replacing clogged filters can improve gas mileage by as much as 10 percent. Keep your tires properly inflated to improve gas mileage. Clear the clutter. Every 100 pounds you carry inside your car lowers its fuel economy by one to two percent. Keep your cool. Use the air conditioner only if you're going faster than 40 miles per hour. When you're cruising around town at slow speeds, roll down your windows. Adjust the thermostat. During the summer, turn it up two degrees, and turn it down two degrees during the winter months. Replace standard light bulbs with compact fluorescent ones. Install timers with motion sensors to ensure that outside lighting used only when needed. Lower your air conditioning bills by planting shade trees, shrubs and grasses around your home. Upgrade insulation to a higher R-value and seal ducts, caulk and apply weather stripping. Replace old, inefficient appliances with Energy Star qualified appliances. Wash full loads of dishes and laundry, and use hot water for clothes washing only when necessary. Recycle copy paper, newspapers and drink containers. Utilize reusable lunch or shopping bags, coffee cups and dinnerware and water bottles, rather than disposing of Styrofoam or paper and plastic cups, plates, flatware, bottles and bags. Properly recycle office products, including paper, ink cartridges, batteries and old electronic equipment. Make the switch to online banking to help save time, postage and trees. Avoid using gas-powered lawn mowers. Instead, use an electric mower or a push mower. If you must use a gas lawn mower, mow before 10 a.m. or after 7 p.m. to avoid peak ozone formation hours. Use a gas barbeque grill instead of a charcoal one. Avoid using chemicals that contain volatile organic compounds (VOCs) such as spray paint, paint thinners, pesticides, glue solvents, weed killers, etc. Avoid activities that use small gasoline-powered internal combustion engines, such as trail bikes, all-terrain vehicles, chain saws, leaf blowers and lawn mowers. Use water-based paints to reduce the amount of solvents that evaporate into the atmosphere and contribute to the smog problem. Develop and implement no-idling policy for fleet drivers and city employees. Utilize biodiesel to fuel city trucks. Replace gas-powered city vehicles with switching to cleaner vehicles, such as gas-electric hybrid, biodiesel and E85 flex-fuel vehicles. Conduct a city walkability survey. Develop and implement a bike and walk master plan designed to encourage residents to walk or bike more to get around town instead of driving. Encourage walking and biking through the installation of bike paths and walking and pedestrian trails. Install bike racks throughout the community to make it easier for residents to bike more. Enact leaf-burning ordinances to discourage residents from burning their yard waste. Conduct a city-wide lighting audit. Make energy-efficient updates to city buildings including efficient windows, lighting, heating and air conditioning and elevators. Retrofit indoor light fixtures at city-owned buildings and other facilities with more efficient lighting fixtures. Utilize LED light bulbs for city traffic signals. Encourage city employees to turn off computer monitors, printers, copiers and lights when leaving the office, and to adjust the thermostat at the end of the day. Replace trash containers on city streets with recycling containers and/or place recycling containers on city streets, in city offices, public buildings, parks and other appropriate locations. Make single-stream recycling services available to city residents. Reduce paper use by encouraging city employees to only print documents when necessary, reuse paper when possible, print double-sided documents and recycle discarded paper. Purchase recycled content paper for city offices. Manage storm water through the installation of permeable pavers, bio-swales, amended soil, rain gardens and retention ponds. Research financial incentives and regulations that facilitate green design throughout the community. Plant new trees throughout the community. Adopt a climate action plan for your city. Develop and implement a sustainability policy for your community. Appoint a city committee focused on the implementation of green practices in the city.